Sino-foreign universities are still small in number. 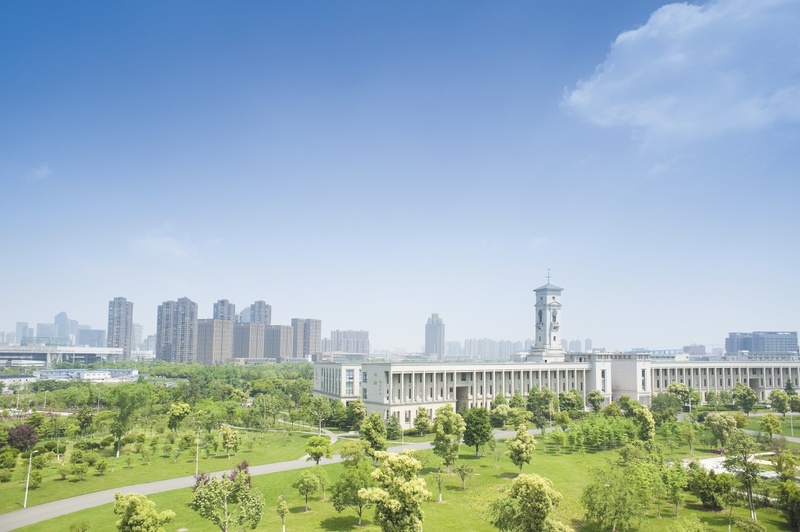 Since the establishment of the first Sino-foreign institution, the University of Nottingham Ningbo China, a decade ago, the number has grown though and npw six have come together to establish the Sino-foreign Cooperative University Union and Presidents Forum. The event was a chance for the leaders of the six joint venture universities from across China to come together with representatives of the local and national government to witness the formation of the Union and participate in the inaugural forum. 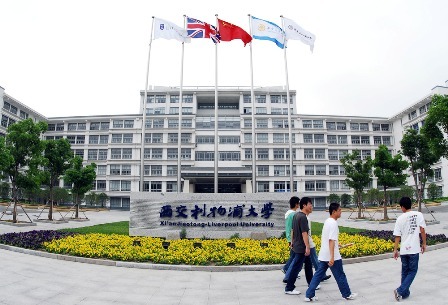 The six international collaborative universities are Xi’an Jiaotong-Liverpool University, the University of Nottingham Ningbo China, New York University Shanghai, Duke Kunshan University, Wenzhou-Kean University and the Chinese University of Hong Kong Shenzhen. Speaking during the morning’s Presidential Forum, Professor Youmin Xi, Executive President of XJTLU, welcomed the distinguished guests and highlighted the importance of the Union of Sino-foreign Cooperative Universities not only for its members but also for Chinese higher education. “It is time for us [the Union] to redefine education,” explained President Xi, citing the competitive advantages of student centered learning, innovative administrative structure and lack of historical burdens as the reasons why universities such as XJTLU will become leaders of the next generation of international higher education institutes. Throughout the morning, senior representatives from the Union followed President Xi in giving speeches and introductions about their institutions to the audience. Members were then encouraged to raise questions and share ideas with one another in order to enhance the understanding of the issues faced by Sino-foreign Universities in China today.Professor Weiqi Shen, Vice-President of University of Nottingham Ningbo China, further developed the principles which set Sino-foreign Cooperative Universities apart from others in China, highlighting “high quality, openness, ‘hybrid vigor’ and legitimacy” in particular. In the afternoon the Forum was joined by a senior delegation from the national Ministry of Education MoE, who travelled from Beijing to participate in the event. The Presidents listened to a speech given by Mr. Jianjun Cen, Director of International Cooperation and Communion Department of MoE who spoke about the important of the Union and the positive effects they hoped it would have on wider education in China. The Union of Sino-foreign Universities intends to continue to explore issues of common concern by sharing experiences and best practices, and to find feasible solutions to these issues. It is intended to enhance communication among members but also to enable members to influence higher education development in China. Although the members are at different stages of development, together they are in a distinctive and potentiallly influential position. It will be interesting to see how the new Union develops. Duke still sounds upbeat about its China campus. Considerable progress is being made on the campus of Duke Kunshan University, Provost Peter Lange said at Wednesday evening’s Duke Student Government meeting. Lange updated the Senate on DKU as that campus comes closer to finishing construction and opening to students. Next week, he will be submitting an establishment proposal to the city of Kunshan that will outline the plans that Duke intends to take after construction is completed. He said there has been some feedback from students concerned that DKU construction is depleting funds that could be allocated to the arts and sciences at Duke. He estimated that Duke will be required to pay about $5.5 million each year to keep DKU running. This small fraction of Duke’s total expected expenditures in the next five years, he noted. To date, the University has raised between $6 and 7 million dollars for DKU. 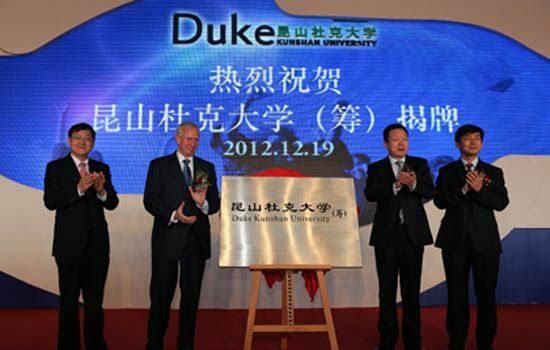 “No top quality university pays for itself with tuition,” Lange said, adding that Duke will pay 50 percent of the operational costs of DKU, and the city of Kunshan will contribute the other 50 percent. Whilst it is, of course, interesting that the $5m plus running cost is “just a drop in the bucket” for Duke, what is more significant is that it does appear that the new institution has suffered from significant delays in construction and formal approval for its establishment is yet to be granted. More recent reports don’t add a lot in the way of positive news for the new university.